I made this map nine years ago and today it will be the first illustration for what I intend to deal with this time. A couple of days ago I was informed about new plans which seriously will affect the Great Barrier Reef, if they are carried through. The Australian mining industry has the plan to build the world’s largest coal mining complex and then a shipping lane to the port which will go through the Great Barrier Reef. That reef is one of the most precious pieces of treasures of life on Earth, a bit like the Earth’s “lungs”, the Amazon jungle in South America. The Great Barrier Reef is the largest living organism on Earth and home to 25% of all species in the World’s oceans. The problem is that the reef slowly is dying. The last 30 years it has lost half of its corals and it’s increasing. This due to climate change and human pollution. If this mining project will be carried through the Great Barrier Reef will soon be dead for sure. The Australian mining industry now plans to build enormous new ports at a complex called Abbot Point in North Eastern Australia, just in the vicinity of the reef. The amount of coal ships each year, going to customers around the world, will be doubled, and the ships rip up ca three million cubic metres of material from the sea bed. If the coal from the planned mines will be burned it will tripple Australia’s current climate pollution. That will no doubt quite soon have led the area’s wild life and nature, – and the world – to a point of no return. The investors from Aurizon know all this, and they are now getting cold feet. This week they will meet discussing what to do. Also Australia’s Environment Minister will choose what to do in the coming two weeks. What decision will Prime Minister Kevin Rudd make? Another aspect of today’s Australia is the one of immigration. In the post-World War Era it was talk of the Ten Pound Pom, and most immigrants were white people from United Kingdom and the rest of Europe. That has changed in recent years. The 2011 Census showed that over one in four of Australia’s 22 million inhabitants came from overseas. Between July 2008 and June 2009 immigrants from more than 200 countries came, 158, 021 of them. From New Zealand 16,2%, United Kingdom 13,6%, India 10,9%, China 10,0%, and South Africa 4,6%. But in 2011-2012 more arrived from India and China than from the UK. From India 29,018 people and from China 25,509. In 2011-2012 184,998 people arrived in Australia all together. Australia resettles the third largest amount of refugees of any country on Earth. The Humanitarian Program 2011-2012 existed in 13,750 locations in the country, and 12% targetted for Women at Risk visas. 68% of Australia’s immigrants come under the so called “skilled migrant” category, which means that people with a desired skill and profession are more easily accepted. New Zealanders is the largest group, (45 000 in 2011-2012), but they come at will in accordance with the Trans-Tasman Mutual Recognition Arrangement. Many of those who are immigrants are now mostly guest-workers. Earlier there were more permanent settlers, but that trend has shifted in recent years. At the same time as the guest-workers are “useful” for a short time, the authorities and the citizens fear them, but also the “boat-people” who arrive as refugees over the seas to seek their fortune and the “foreigner worker-card”. Earlier this year former Prime Minister Julia Gillard, (the Labour Party), held an infamous speech at Rooty Hill where she expressed her fears of the effects from the “boat people”. On June 27th 2013 Julia Gillard lost her post as Prime Minister to her party colleague Kevin Rudd with her 45 votes to his 57. How do we deal with these things such as migration? It is no easy matter, neither in Australia nor in other places on Earth. This last Friday a boat with refugees from Libya in North Africa arrived in Italy, but 31 of those aboard the small floating vessel had drowned on the way. Since this last Friday more than 500 people have been dragged up from the Mediterranean Sea after having tried to reach Europe from North Africa. We still have to remember that this is exactly how the first inhabitants of Australia came there in the first place, 50 000 or 60 000 years ago. They came from South East Asia about 60 000 years ago, over New Guinea on small vessels, rafts on the wild seas. Incidents like those in the Mediterranean Sea the other day must have been likely, or the boat refugees to Australia today, except that the distance was shorter then than it is today. The Newcomers arrived on Arnhem Land and the Cape York Peninsula. Over the coming thousands of years the different tribes of Australia were hunters and gatherers, picking berries, and hunting games like kangaroo and emu. In the dryer regions, such as in the deserts, they learned how to find edible plants and walk long distances in their search for food. Those who lived in the forests used to lit bush fires to clear the undergrowth to make hunting easier. 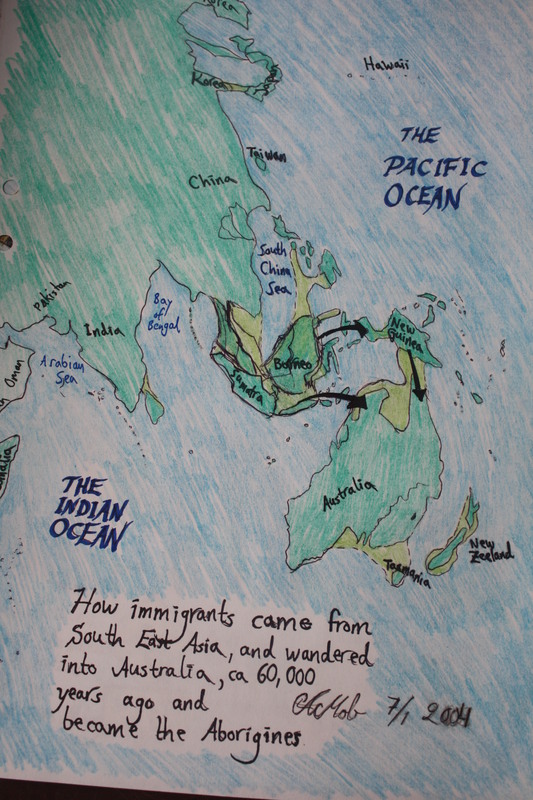 The Aboriginal peoples divided the lands into sections using geographic boundaries such as rivers, mountains or lakes. Since the Aborigines didn’t mark those boundaries those borders were not understood and recognized by the white Europeans when they arrived. All Aborigines had specific roles in the family, and the social control wasn’t performed by any government or authority, but instead by a well developed system of beliefs and traditions referred to as “The Dreaming”. That was a long tradition of legends about the past, chanted by the camp fires, accompanied by instruments like the wooden horn called didgeridoo and also clap-sticks. According to their beliefs everything was created by their spirit ancestors during “The Dreamtime” when the Earth was newly formed, and the humans arrived in Australia. All over the continent you might see cave paintings depicting the Dreamtime. The original inhabitants belonged to ca 500 different tribes, with 28 language groups containing originally about 700 languages when the Europeans arrived. Since then most of those languages have disappeared and now only 250 still remain. Today only about 40 000 – 50 000 Aborigines speak any of these languages. The vocabulary reflect what you see in the environment: animals, plants and culture. 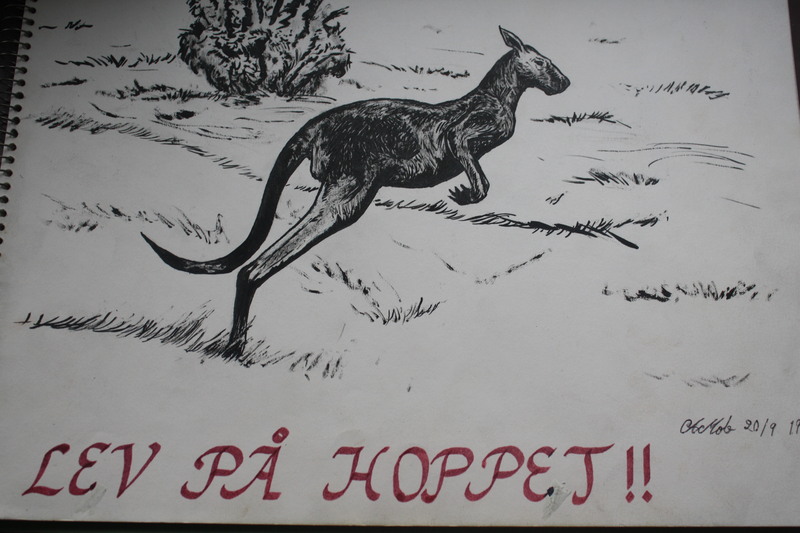 A few of those words have become part of many other languages outside Australia, such as “kangaroo”, “koala” and “boomerang”. The first European to lay eyes on Australia was the Spanish sailor Luis Vaez de Torres in 1606, and that same year also the Dutch seaman Willem Jansz explored the western parts of Australia and he and his men fought some Aborigines. In 1642-1644 the Dutch captain Abel Tasman sailed around Australia, and the southern island was then named after him: Tasmania. He also “discovered” New Zeeland which was named after the district Zeeland in the Netherlands. On August 25th 1768 the British captain James Cook left Plymouth harbour in England on his ship The Endeavour. After a long journey they came to South East Australia and cast anchor in a large bay. Aboard were the botanist Joseph Banks from London and also the Swedish botanist Daniel Solander who was desciple of Carl von Linné/Carl Linnaeus. Banks and Solander found 1 300 new plants and Cook decided to name the place Botany Bay, now near Sidney. Cook and his crew continued north and once hit ground on the Great Barrier Reef. The Aborigines watched with interest the white men repairing the 30 meter long ship. 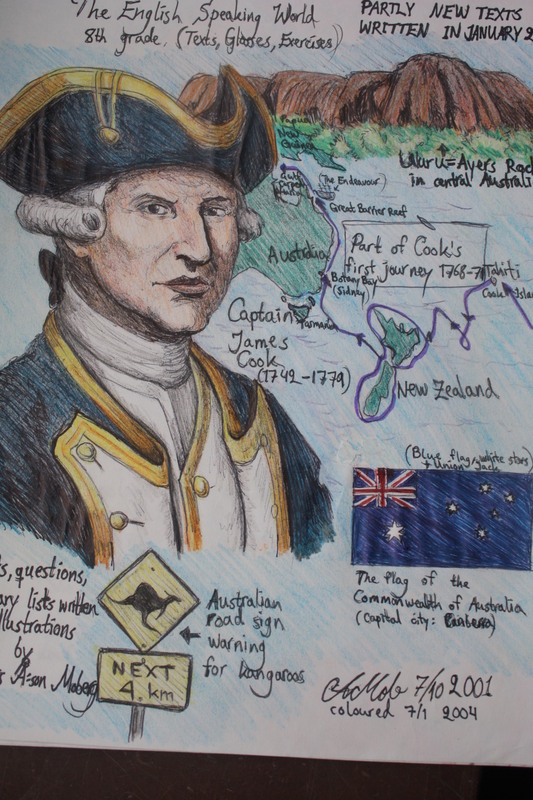 On August 22d 1770 James Cook claimed Australia for the British king George III. 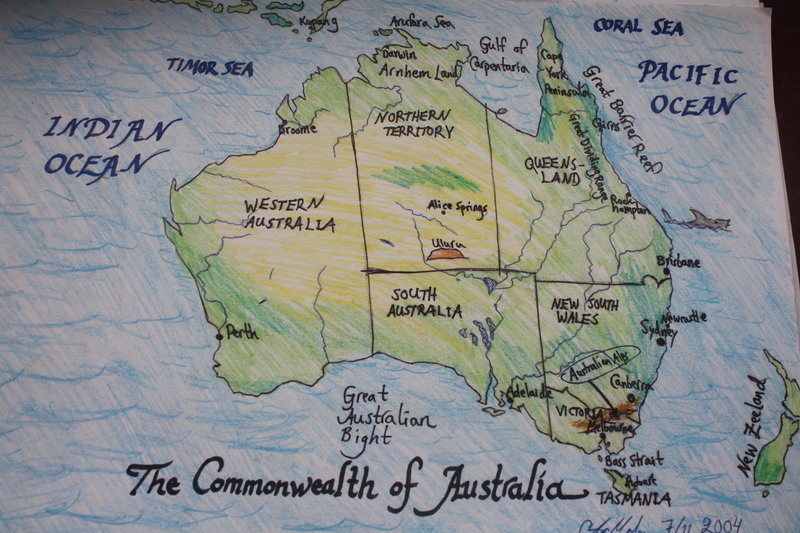 It was called Australia after the Latin “Terra Australis”/ “The Southern Land”. In 1786 Great Britain chose Australia to become their new penal colony. Since the Americans revolted in 1777 and Great Britain lost control of what’s now USA they needed someplace else sending convicts to. On January 26th 1788 the first ship with convicts from England, Scotland and Ireland arrived in Port Jackson, today’s Sidney. The tragedy has been that the Aborigines have been persecuted by the white men ever since then, all through the 19th century and up to the 1960’s. They were treated in a racist and cruel way: ended up in poor habitations, bad education, high unemployment and alcoholism. Even if they have regained some of their lands and honour they still fight a reluctant and slow Australian bureaucracy. In 1971 the artist Harold Thomas made the Aboriginal black and red flag with a yellow circle in the centre and named 1988 as a Year of Mourning, 200 years after the first landing of European soldiers and convicts. In 1999 there was a great assembly of Aboriginal people in Canberra working for Aboriginal Sovereignity. Because of all the persecutions and waves of new immigrants the Aborigines now only make up 2% of the population in Australia. In the far north there’s Arnhem Land which has been confirmed as their own territory. Also some ancient Aboriginal religious sites have been recognized by the government, like Uluru/Ayers Rock in central Australia. The situation in Australia today both when it comes to attitudes to immigrants, and people as such is similar to what we see in most places here on our planet. There are variations of course, but many similarities on a general level. The question is how we deal with it in a way so that we manage to find acceptable bridges between us? The situation for the Great Barrier Reef though is severe, and if that marvellous natural treasure is lost, there’s no road back, and that together with so much else here on Earth WILL have an effect on us and the lives we lead. How can we co-operate in dignity? Joseph – A story of envy, dedication, loyalty and reward. What can we learn? The story of Joseph in the Old Testament’s 1st Book of Moses, Genesis, is an enticing story which seems to have historic truth behind it. Also when it’s interpreted for a modern present context it might teach us something both of our ancestors globally and of ourselves. I’ll come to that later. What’s called the Old Testament by Christians is by the Jews, (who really “owns” the story and the texts originally), called TaNa’Kh. That’s an abbreviation of Torah, Neviim uKhtuvim, i.e. “The Teachings, the Prophets and the Writings.” I will here give you an account of the story in the Bible, archeological findings, but also some ideas of how we might interpret and use the story in our own present day in a modern and progressive context. 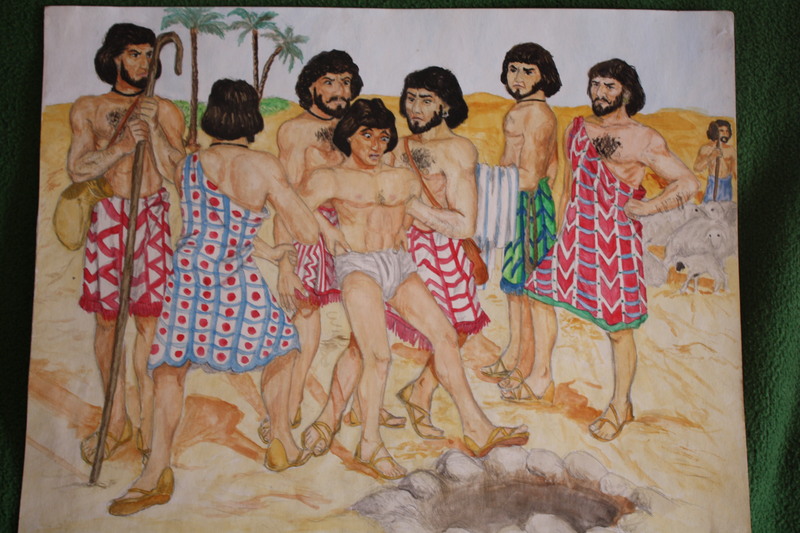 The painting you see above I made when I was a youth and it shows Joseph and his brothers when they out of envy rob him of his long-sleeved, multi-coloured coat and throw him into a well, (Genesis 37: 22). The five books of Moses that make up the written Torah are called Bereshit/Genesis, Shemót/Exodus, VaYiqrá/Leviticus, BaMidbar/Numbers, and Devarím/Deuteronomium. At the end of Bereshit/Genesis we find the story of Joseph and this is roughly how it goes. Jacob/Ya’aqov had 12 sons and Joseph was the eleventh of them, 10 with Leah and the two last with Rachel. Of all his 12 sons Jacob loved Joseph the most, and favoured his second youngest in different ways. Joseph had a skill. He was good at interpreting dreams and he at one point had a dream where he said that he would become the king over his older brothers. That vexed them. Joseph also got a long-sleeved multi-coloured coat when he was 17 years old by his father, which made the others very angry. One day he was told by Jacob to go to his brothers who were herding the sheep near Shechem. The brothers decided to get rid of their annoying dreaming brother for good. To kill him, throw the body in a well and tell their father that a wild animal killed him. The brother Ruben though hindered the others from killing the boy, but they tore Joseph’s coat from his body and threw him in the well, (Genesis 37: 23-24). The brothers, except Ruben, then sold Joseph to some passing Ismaelite merchants, (ancestors of the Arabs) for 20 shekels. When Ruben discovered what the others had done he tore his own clothes from grief, but they took Joseph’s cloak and dipped it in blood from a slaughtered lamb to fool their father. The Ismaelite merchant caravan sold Joseph in Egypt to a wealthy nobleman called Potifar. Then Joseph became a slave and served Potifar well for some years. Potifar’s wife however got a crush on the young foreigner and wanted to seduce him. Joseph rejected her and as a punishment she said to her husband that Joseph had tried to violate her. Potifar got furious and sent Joseph in prison. There Joseph showed his good side, became liked by the prison chief and was given responsibilty for the other prisoners. 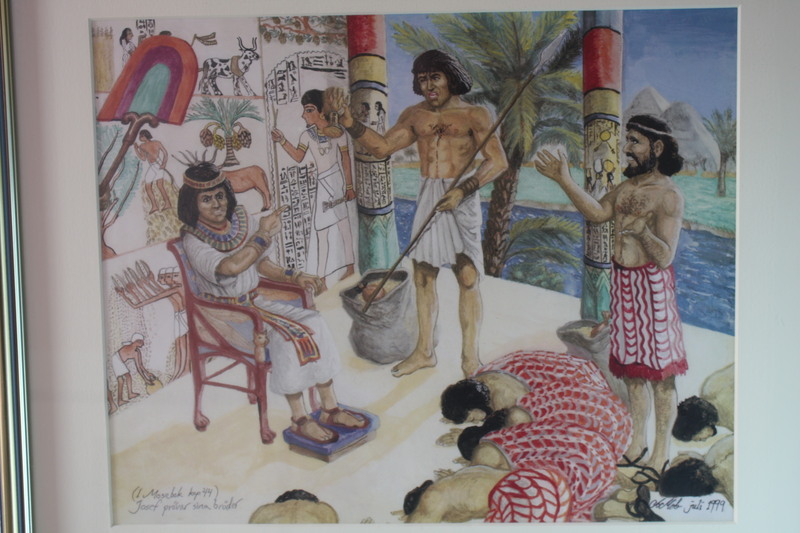 At one point two new prisoners arrived who had been working for the Pharao: a butler and a baker. Those two also had dreams which Joseph interpreted. He foresaw that the butler would get his old job back after three days, while the baker would be hanged. That also happened. Later the Pharao also had a period of troubled dreams. He dreamed repeatedly that seven thin cows ate seven fat cows. Then the butler remembered Joseph and his prophecies and Pharao called for him. Joseph interpreted Pharao’s dreams and said that first there would be a period of seven good years with good harvests, followed by seven years of famine. Joseph told the Pharao that he ought to appoint someone to be in charge of the gathering of food supplies the next good seven years. The Pharao appointed Joseph as vizeer, gave him a ring, a necklace and the new Egyptian name Safenat Paneach. Now Joseph had a high-status job, and began his task at the age of 30. Joseph got a wife, Asenath, and with her the sons Menasseh and Ephraim, (Genesis 41:5). Joseph had grain stored and when the famine arrived, and the starving people came to Pharao, they were directed to Joseph for supplies. As the famine continued it affected also the land of Canaan, Joseph’s homeland in today’s Israel. Joseph’s brothers, except the youngest son Benyamin, came to Egypt for supplies. When Joseph saw them he recognized his brothers and wanted to test them. He invited them and asked his brothers about the situation back home, and if their father still was alive. He also wanted to test and punish them a bit for selling him those years earlier. As they left Joseph went out and wept. The brothers were given sacks of grain. Then Joseph accused them of being spies on the Pharaoh, and they were imprisoned for three days. Joseph asked them to leave one brother in custody and go back home to their father in Canaan before they arrived again. They did so, puzzled and was asked by their father Jacob to return to Egypt. When they were back with Joseph he had first some money placed in one of the sacks with grain they got, and later a goblet. Joseph had guards sent after the brothers who were sent back to him. They were accused of theft again and the goblet was taken up from one of the sacks. The brothers were horrified, and said that they were innocent. Joseph then couldn’t restrain himself and told the frightened men who he actually was. He invited them for real and asked them to go back to Shechem and fetch the old Jacob and the remaining youngest brother. They did so and Jacob was happy to hear that Joseph lived and had become vizeer of Egypt. Jacob and his sons moved to Egypt and settled there with Joseph/Safenat Paneach who lived at a beautiful estate for his good services to the Pharao. Their descendants would later increase in Egypt, and some hundred years later be victims of a genocide by another Pharao and led out of Egypt back to Canaan/Israel. Read more about that in my text “The story of Passover – Truth or fiction?”. Is there any historical truth in the story above? Maybe, even likely. One detail which rings true is the selling of Joseph to the Ismaelites for 20 shekels. That sum is accurate according to ancient Egyptian sources for the period ca 1850-1750 BCE, which seems to be the period of Joseph. There’s also a parallell story to the one of Potifar’s wife who wanted to seduce Joseph and then as revenge accused him of violation. That is the story of the two Egyptian brothers Anpu and Bata in the ten leaves of the Orbiney papyrus from around 1215-1185 BCE. In that story the wife of Anpiru tries to seduce Bata, but fails and then tries to take revenge in several ways. More importantly though is the Bahr Yusef. What is that? Bahr Yusef/The Waterway of Joseph is a man-made 15 kilometre long and five metre deep canal from the lake Birket Qarun in the region of El-Fayyum, central Egypt to the River Nile. This to keep the land fertile and avoid further famine. It was made during the era of Pharao Moeris/Mery Ke Re, also called Amenemhat III (1844-1797 BCE) in the 10th dynasty. It is said that this huge flood- and irrigation project was made on the orders of someone called Joseph, hence the name. This canal and lake still exists and is still called Bahr Yusef. It has also been called Mer Wer/The Great Canal. Climatologists have proven when looking back in time that there was a severe drought in Egypt during the seven years 1799 and 1792 BCE, which is an interesting equivalent to the supposed time span we are talking about. The Egyptologist David Rohl has mentioned this fact in his studies, but also the finds of remnants of an ancient mansion and a mausouleum just south of the small palace containing a big statue of a man in the outskirts of what was the ancient city of Avaris. The statue has been demolished, but the foundation, bits of the body, the head and shoulders still exists, as do remnants of the colours. This statue has had red hair, a bronze-coloured skin, and a coat in Canaanite style with red, black and white stripes. According to David Rohl this could well be Joseph’s mansion, his tomb in Egypt and a statue of his likeness. The bones from that tomb has been removed, and according to the Bible Joseph’s descendants, Moses and his followers, took the bones of Joseph with them to the land of Canaan. One holy shrine for Jews through the ages has been Kever Yoséf/Joseph’s Tomb outside Shechem/Nablus, a site fought over by Israeli Jews and Palestinians not long ago. What can we learn from all this? Well, most likely many things. First of all that conflicts always have existed: rivalry, jealousy, hard work and tough times. This is nothing new. 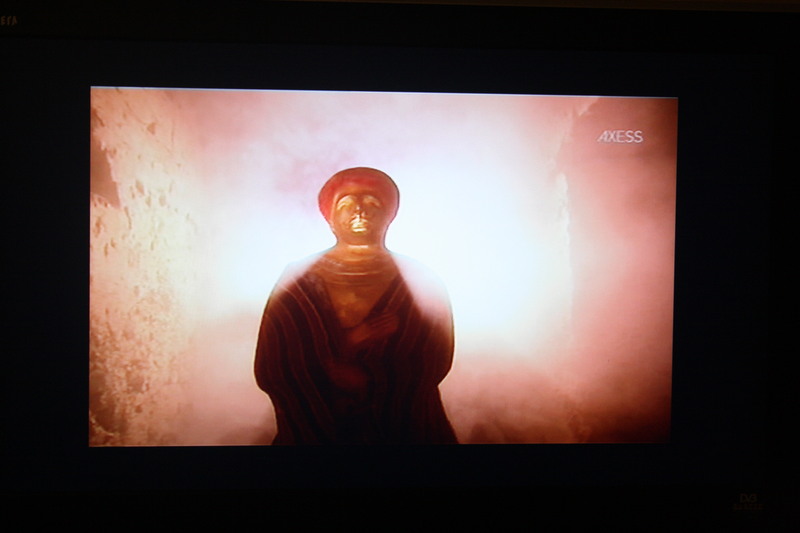 We also learn that the conflict in the Middle East is ancient, but it affects us all. According to the Bible Joseph was true to God and therefore succesfull. For many Jews the story of Joseph is part of their heritage, but since the Bible has spread all over the world and evolved into the creed of Christianity as well, and also a different version of the Joseph story in the Quran, this is a story known by a huge amount of people. We also see in the story a migration of people, how Joseph had to adapt to a new surrounding, a difficult but necessary thing for any migrant also in our days. Joseph was given a new name, Safenat Paneach, (a phenomenon used by the rulers of an area or a culture worldwide for millennia). However he also was given trust and responsibility in the new country. Therefore it’s no surprise that many immigrants try to adapt in a new country, even though they don’t flee their homeland just for fun. Joseph didn’t forget his roots, and neither do any of us. It is not racist to be proud of one’s origins, nor for ordinary Swedes or any other nationality. The problem is how it’s manifested, and where the lines for “us and them” are drawn. If he did exist, which these pieces of evidence certainly indicate, Joseph must have been involved in many severe traumas, and nice moments too, just like many of us today. He nevertheless was rewarded for his hard work, his ambition and loyalty in ancient Egypt. Now in July 2013, ca 3 800 years later, there are new demonstrations and violent protests in Egypt between the “dethroned” Mohamed Mursi’s followers, vs the military, the secular, feminist and liberal movements. It is said that new elections will be held this coming winter, which the Mursi-followers detest. The Christian Copts and the Jews in Egypt today are persecuted, so are the Christian Palestinians on the Gaza strip, in Israel, in Iraq, Pakistan and other countries. The tension is also harsh between today’s Israel on the one side, the Palestinians and different Muslim states on the other who want to eradicate that country from the map and kill all the Jews or convert them. However peace-talks may be at hand, but the conflict in the Middle East and about the world as such is severe on many places on Earth. These conflicts and fights concern natural resources, ideologies, belongings and identities. We are many and we are diverse. Nevertheless, what I personally would like to see is better attempts for peace between us, where we actually help each other and try to see the brother, sister, son, daughter, companion, friend or partner-in-love in a wider range of people. The biggest loyalty we have here on Earth is the one to a common ancestry which all we humans share way back in time. To our loved ones, but also to the world we live in. If we continue hating our differences and kill our humanity this will hardly be a good thing for any of us, especially since the Lord God wants us to love each other, even our enemies,. We must be able to love and to forgive, if we want the Lord Jesus to forgive us for our own transgressions. Let us at least try to love and help each other. Either we’ll get to Heaven as a reward in the next dimension, or we ‘ll end up in the eternal flames for our stubborness, our inequities and infidelity against the the Eternal Light, and Blemishfree Creator of our Universe… And that is something we do not want. That is why it is exceedingly important to turn to our Lord and Saviour Jesus Christ and invite Him into our life while we walk here on Earth, ask for His forgiveness, and on a daily basis follow his commands. Watching the moon is often a magic feeling for us human beings, and has been so since the early stoneage, independent of where we or our ancestors have lived on this Terra Firma which we call Earth. That celestial orb has been a guide, a deity for some, and is no doubt essential for all life here on Tellus. It influences us all and has modifed all life, including our ancestors and way long before that since time immemorial. It adjusts our planet’s orbit around the Sun, it influences the length of the days and nights here on Earth, it affects the moods of animals and some people, and it regulates the tide-waters of ebb and flow. How much have changed over time. The most accepted theory among modern scientists today is that our moon was formed after an intense collission with our planet. Our solar system was very young and chaos ruled the infant galaxy and the other parts of space. About 4.5 billion years ago another planet which was about the size of Mars collided with the young lifeless Earth, and nearly destroyed both itself and Tellus. Our planet tilted and began leaning on its side and twist a bit around its own axes. Large parts of both planets were ripped apart and thrown into space. Eventually our Earth healed itself and collected the run-away pieces together. Other pieces from the destroyed planet and our Earth began forming itself too into a smaller planet – our moon. For a long time the moon was much closer to Earth and when our planet was covered with oceans etc that made the days here shorter than today, the seas much wilder, the waves much higher, and the winds much faster and stronger than today. That chaos also contributed to the development of the first simple lifeforms. Ca 3.8 billion years ago our solar system came in unbalance when suddenly Jupiter and Saturn shifted places and asteroids from the outer rim were thrown violently in all directions. Lots of them hit both our planet and the moon. The big “oceans” of magma on the moon which “quickly” cooled off were formed then. Later smaller asteroids and rocks have hit the moon and formed new smaller craters.This according to the new widespread Nice modell from 2005. Astronomers like James Head at the Brown University on Rhode Island, USA is one of many other brilliant minds which have developed these scrutinized modern theories. Over the following millions and millions of years the moon moved further out from us, contributing to the stabilization here on our planet which is so important for our very existence. We got 24-hour days regulated by the moon, four seasons of the year, and “milder” tide-waters. The moon continues to move away from Earth and will in the next millions of years be barely visible from our precious Earth. As it is now the moon when it’s closest to Earth it is 384. 400 kilometres away, and as farthest 406. 700 kilometres from our planet. It circulates our planet in 27 days and rotates around its own axes also in 27 days, which makes us always see the same side of the moon. We never see the “backside” which is actually brighter lit because it’s closer to the Sun. The core of the moon is made of iron and is 300 kilometres big. The diametre of our Lunar neighbour is 3476 kilometres. The surface is covered with rocks and sand. The moon affects us all. It is beautiful to look at and evokes feelings of awe, grandeur, humility for how small we are in the vast Universe, respect for its influence, and fear because of our ignorance and superstition. I like watching the moon and I too often am filled with some of these feelings, mostly with awe, humility and delight for its beauty. The moon is both a stabilizing life-giver, but also shifty, and there’s a reason for why some people lose their minds at full moon, La Luna, and become “lunatics”. All the same mostly our closest neighbour in space is a comforting factor. That is something that we too here on Earth ought to consider in our own behaviour. We are small, tiny creatures in the Universe. We are minute beings on a planet which we inhabit for a short while. We are many, we are both good and caring, but also stupid, evil, destructive, self-destructive and dumbfounded. We have inherited this Earth as a precious ground to love and cherish. If we could see ourselves from the moon what would we see? How would we percieve ourselves, what we do to ourselves, each other and the planet we live on? What can we take care of? How can we maybe take better care of ourselves and of each other? Do we want to contribute to our own undoing? Do we want a destroyed planet? Do we want a World War III with nuclear bombs? Do we want devious gas-attacks ordered by psychopathic maniacs, and a humanity in ruin? Of course not. So…What can be done? What can we do? How can we co-operate, love each other and save ourselves and other life forms? Why not then join “the man in the moon” and watch the spectacle from his point of view? Why not listen to the voices of reason? Why not listen to people who care and try to find good ways forward? Let us co-operate in a good way irrespective of gender, age, religious, social or political ideology. 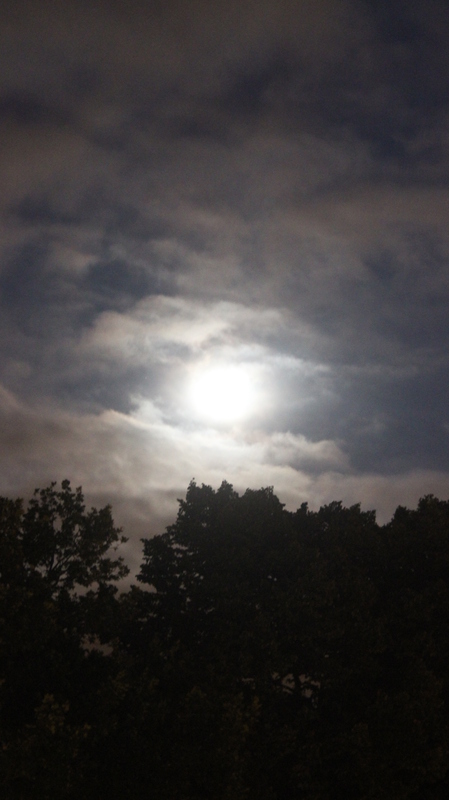 Let’s not be lunatics, but instead wise as “the man in the moon”. Yesterday the massacre on the island of Utöya and in central Oslo, Norway, where 77 people were killed was yesterday commemorated on many places in Norway and here in Sweden. Also here in Malmoe. The photo above I took during the concert in memory of the innocent victims of that massacre. 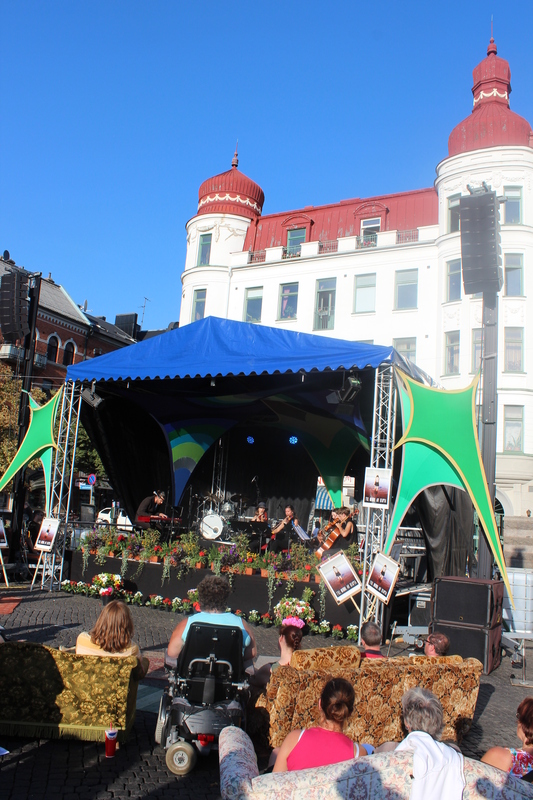 The concert was held at the Mill Field Square/Möllevångstorget between 7 and 10 pm last night. On July 22d 2011 Norway’s capital city Oslo woke up to what they thought would be just an ordinary day. But they were wrong. A political terrorist on the far right-wing had decided to finally strike. Anders Behring Breivik, a blonde Norwegian in his mid-30’s who hated the multicultural society, had feeded his hate and planned his terrorist attack for several years. He wanted to start an anti-multicultural revolution and kill those whom he saw as traitors of the country. It was a very political and cold-blooded terrorist-attack by a man who saw himself as a modern Crusader on the extreme right. The hatred he had inside can be seen also among many others today on the Internet, within political parties and various sub-groups on many places here on Earth. It’s a great tragedy that what he did was not an act of a lone maniac, but based on actual ideologies on the extreme wing still existing. Anders Behring Breivik decided to really, really strike hard on his own country. That morning on July 22d 2011 he placed bombs close to the Parliamentary buildings in central Oslo. When the bombs blasted it destroyed parts of the buildings, and the first eight people that day died. Breivik hated the ruling government and wanted to make a distinct statement. Then he dressed like a police officer and took a boat to the island of Utöya where the Norwegian Social Democratic Youths in their teens and early adulthood had their summer camp. Gro Harlem Brundtland had been there that day and held a speech and Breivik wanted to kill her too. When he came to the island the ca 500 youngsters and the few adults in charge first just saw a policeman approaching. Then he took up a gun and began shooting people. Panic in the masses. Young people fled all over, and also the grown-ups. Breivik walked around the island and killed as many as he could find. Youngsters hid behind trees and rocks, in cabins, out into the water to swim away from the killing maniac ashore. Some were helped aboard small rowing-boats by people who heard the shots while Breivik shot people in the water which was coloured red by their blood. Cool and relentless he walked calculatingly across the island and killed 68 people there, apart from those already dead in the Parliamentary Buildings in central Oslo. Most of those killed that day were youngsters. When the real Norwegian police arrived to the spot Breivik was arrested, and he showed no remorse, but instead smiled a grim, cool-hearted smile. When the bombs blasted in central Oslo that morning media and many others were quick to assume that it was Al-Qaeda who had performed another terrorist attack, but as soon as it became clear that it was an “ordinary” Norwegian the tone changed and it was talk about a single maniac, not a political terrorist belonging to an existing ideology. Like all extremists Anders Behring Breivik don’t want a democracy, but a totalitarian state with a Nazi ideology. A society ideal similar to other extremists on the left wing, or religious fundamentalists of various creeds who also seek totalitarian solutions in some form. Breivik was later sentenced in court and imprisoned. One of the young surviving Social Democratic youths from Utöya and who also was in Parliament, Stine Renate Håheim, said a few days after the massacre: “If one man can show so much hate, consider how much love we all can show together”. Those words of Stine Renate Håheim was mentioned on more than one occasion yesterday evening during the concert called “Till minne av Utöya”/In memory of Utöya”. Her words was also a foundation for the entire atmosphere on the performances and in the audience yesterday. 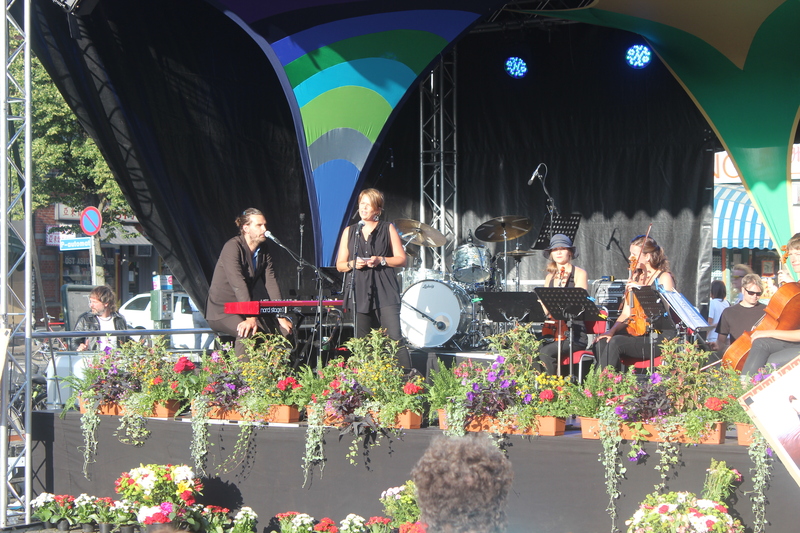 The concert on Möllevångstorget was arranged by Pontus Stenkvist and SSU, the Social Democratic Youth Organization here in Malmoe. The Social Democratic Party here in Sweden was founded here in Malmoe in the 1880’s and has a stronghold here ever since then. SSU also had tables near the stage selling coffee and cakes, but also books and leaflets. The concert itself was for free. It was a fantastic evening. 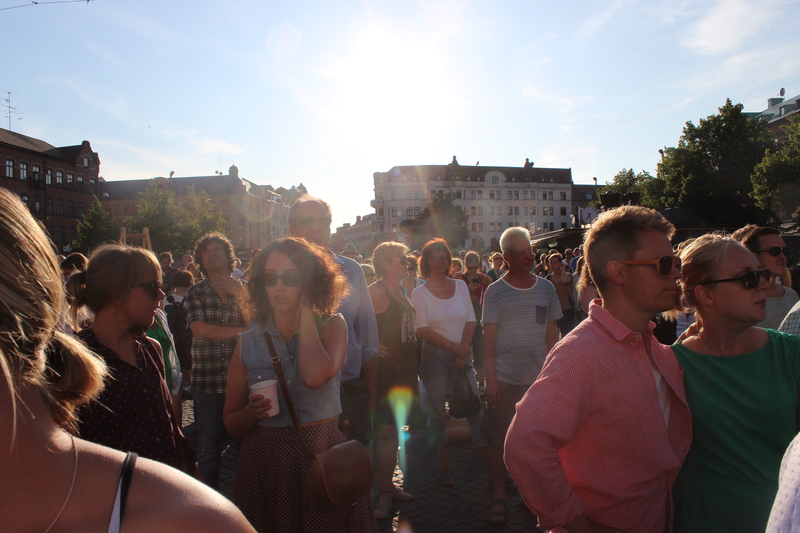 It was warm but not too hot and the beautiful summer sun lingered on in its summer-evening shape. The atmosphere was cosy and the audience mixed. There was a mix of elderly people, middle-aged, young adults, teen-agers, children and infants in waggons. Both women and men, girls and boys, and the ethnic mix was marvellous. Just as it should be on a situation like this. In front of the stage sofas and chairs were placed, but most spectators, (a few hundred of them), just stood there listening to the music and speeches and talking to each other. The feeling of relaxed companionship, affection and acceptance was ever present. The concert started though with a number which commemorated the assassinated politician Anna Lindh who was killed at the shopping mall NK in Stockholm in September 2003 by Mijailo Mijailovic who hated all politicians and happened to get his eyes on her that day. The musician Kristoffer Jonzon and Vindla have made a modern musical in her memory and about that assassination called “Anna”. They played a number from that new musical and voices from the news that day and of the Swedish Prime Minister then Göran Persson. Then we heard what Jens Stoltenberg, Prime Minister of Norway two years ago said after the massacre on Utöya and the attack on the very idea of democracy. Malmoe’s new leading politician after Ilmar Reepalu, Katrin Stjernfeldt-Jamme, held a speech where she pinpointed the very idea of democracy and the importance of the words of the young woman who had survived the massacre. Stjernfeldt-Jamme’s words were wise and penetrated the minds. (You see her in one of the photos above). After her speech many different artists appeared on stage: Magnus Tingsek, Krister Jonsson Trio and a speech by Amabassador Jan Eliasson was read. Miriam Aida sang catchy and grunchy reggea songs about love, and companionship and the musicians on stage helped her giving us the rhythms to convey the musical message. Other artists were Maria Davidsson Stille, Alexander Holmgren, Thomas Holst and Jalle Larsson from the old rock band Wilmer X. Another speaker took up the subject of the free word, but also how often totalitarian régimes, past and present, have feared and still fear the global, national and local awareness concerning the state of things. Those régimes often hate, oppress, persue and kill intellectuals. Very true words. At the end of the concert a young man read his poem about hatred and the destructive effects of that hate. When I went home I pondered upon how important this message is for us to survive in the harsh world. It’s a message well considered taking to heart and do what we all can to find a balance between individual pride, ambition and success, and caring about others. No-one can do everything and we can’t take in everyone, but we can all do something for a more dignified and responsible world…For our own sakes, for our own pride, for the pride and responsibility for the planet we all inhabit, for each other and the future generations. Yesterday afternoon I went to Lomma Harbour together with my friend the conductor Kristofer Wåhlander and his parents to visit another friend of ours, Thomas Håkansson who now has a small place where he is selling herring. 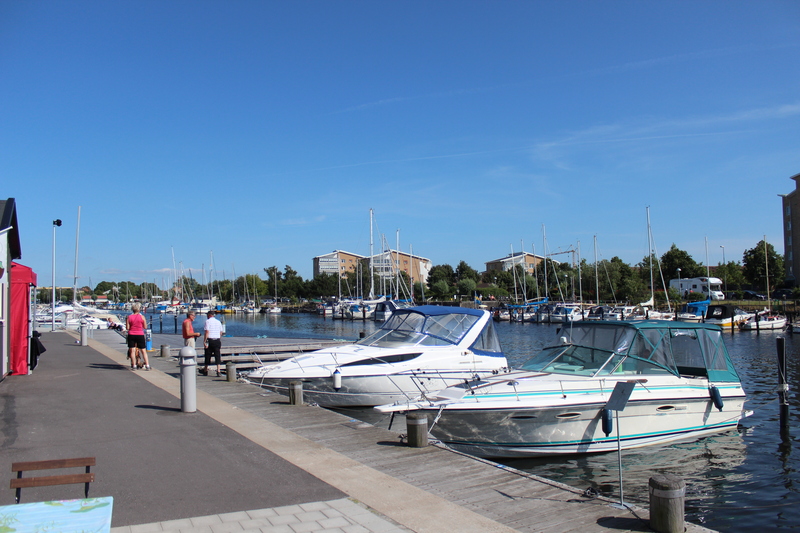 Lomma is a place a few kilometres north of Malmoe and a place nowadays where mostly people who are well-off live. Thomas Håkansson lives in Kävlinge, a municipality north-west of Lund, but here in Lomma on the Scanian south-west coast north of Malmoe he now runs his small business. For many years Thomas was a carpenter and a wrestler. He lived then in a renovated 17th-century house in central Kävlinge and had his carpentry on a hill on the opposite side of the Kävlinge River. I met Thomas and Kristofer back then when we all participated in the Viking Stage Plays. It was great and good plays. Thomas still is involved in the theatre business. Sometimes as an amateur actor, and partly as a stage- and set-builder. He’s been involved both in ordinary plays and operas. Thomas Håkansson some years ago sold his carpentry and started working extra in the health-care system, married and got children. He’s an active man and a down-to-earth Scanian. When he saw me yesterday he exclaimed: “Anders Moberg. Men halleåu” with broad Scanian diphtongs and a smile. When Thomas came to Lomma about a year ago he joined a man who had this place before him. This little store was then called “Sillapågen”/”The Herring lad”, and they sold herring to those who passed by. After a while Thomas discovered that the owner then was a scoundrel and a trixter, despite his 75 years of age. 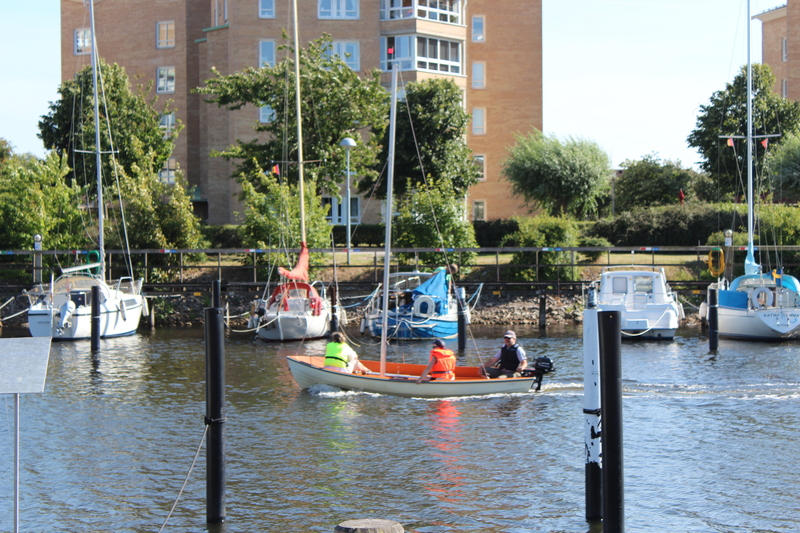 So noticed the others in Lomma Harbour, so a couple of months ago that man was kicked out, reported to the police and lost his business. Then Thomas saw his chance and bought the place. He has now run it for five weeks. 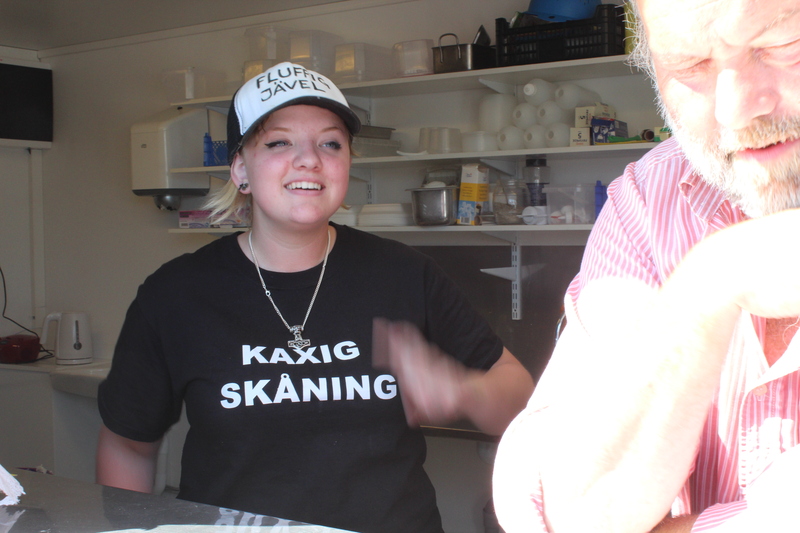 The new name of the place is “Sillakungen”/”The Herring King”. 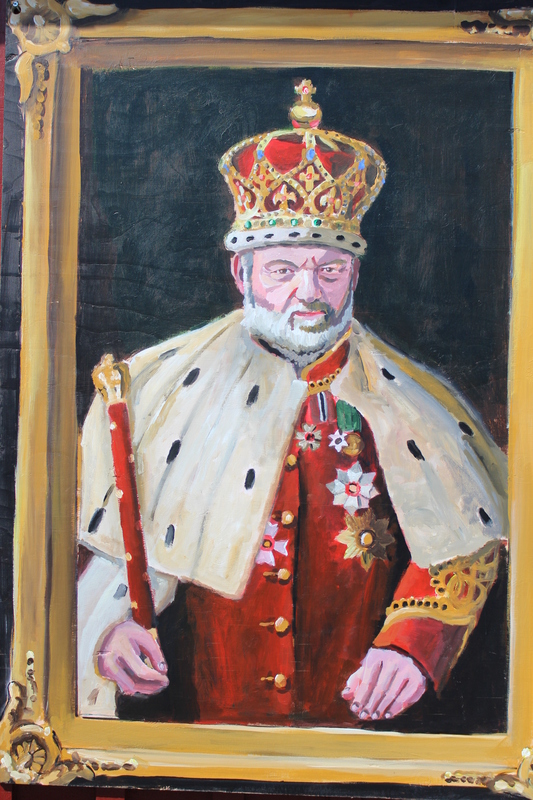 There is a portrait of Thomas as a king on the cabin wall, but the new logo will be the sea-god Neptune in a crown, and his trident in hand, as well as a barrel of herring. That logo was just finished yesterday, but Thomas hasn’t had time to use it yet. He has his new business seven days a week, and open from 10 am to five pm . Thomas is selling slices of bread with herring on it, plates with herring, mashed potatoes and lingonberry jam, and also salmon. Thomas is helped by a young woman in the store who also serves the customers. 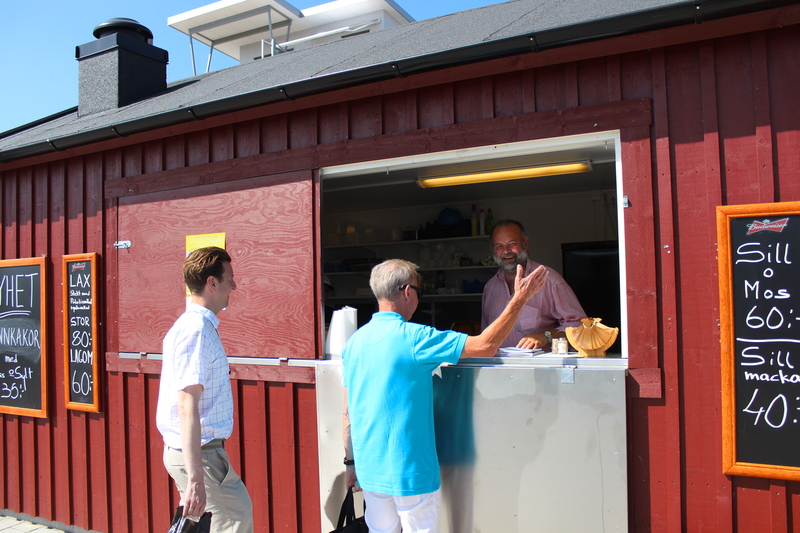 Thomas has his devout customers, and also random ones who pass by and get some genuine Scanian sea food. From the early High Middle Ages until the mid- or late 1600’s Öresund was teaming with herring. It was the fishing of and mercantile business with herring that once made this region flourish. There were fairs and market places along the south and west coast of Scania which grew in importance. Falsterbo and Skanör on the Falsterbo Peninsula in the south-west corner was one very important place for several hundred years, and the city of Malmoe also was founded in the 12th century and grew in importance until the 16th and early 17th century thanks to the herring trade. Thomas Håkansson doesn’t have any web site or e-mail adress, but he can be reached on his phone +46 (0)70-111 25 62 or +46 (0)393 96 04. 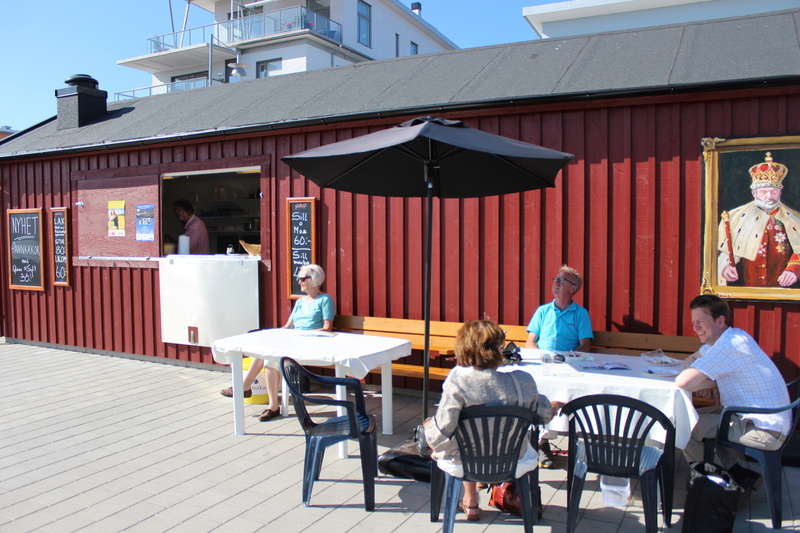 The big store Konsum in Furulund has contacted Thomas and wants to buy herring from him not only in the summer time, since the store here in the harbour won’t have many guests in late autumn, during winter and spring. Thomas is buying his fish fresh and is then preparing it. Thomas intends also to make deals with Konsum in Kävlinge and then he’s satisfied. He prefers to run a small business. The food was good and Thomas and his aid knows their business. I can recommend anyone to go and visit Thomas, The Herring King, and eat some ordinary, but very good fish. It’s worth it. Kristofer Wåhlander also put up posters on the wall about an opera concert on Borgeby and Torup castles respectively in August and September. That too will be enjoyable no doubt. 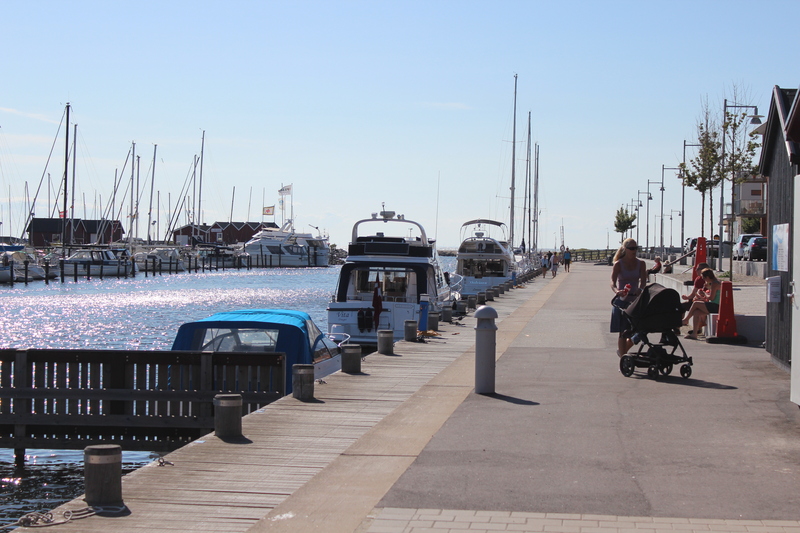 Lomma Harbour is beautiful, especially on a day like the one yesterday. The houses are neat and modern, the water gleaming in the sun and along the bridges various forms of motor boats and sailing vessels are seen. If you want to sail this is a good site to go from, or if you just want to take a stroll in the harbour that is also worthwile. Take a trip to Lomma and enjoy! Two days ago I was invited to a seminar here in Malmoe about what REVA has done to this city. 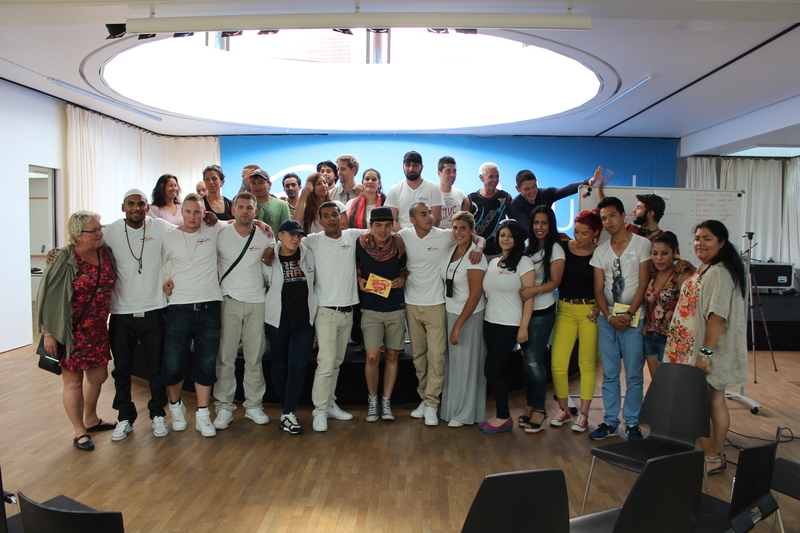 The seminar was arranged by Hassela Ungdomsrörelse/Hassela Youth Movement in co-operation with Spiritus Mundi, Asylstafetten 2013/The Asylum Relay Race 2013, Skånes Stadsmission/Scania’s City Mission, Malmö mot Diskriminering/Malmoe against Discrimination and Malmö Högskola/Malmoe University. 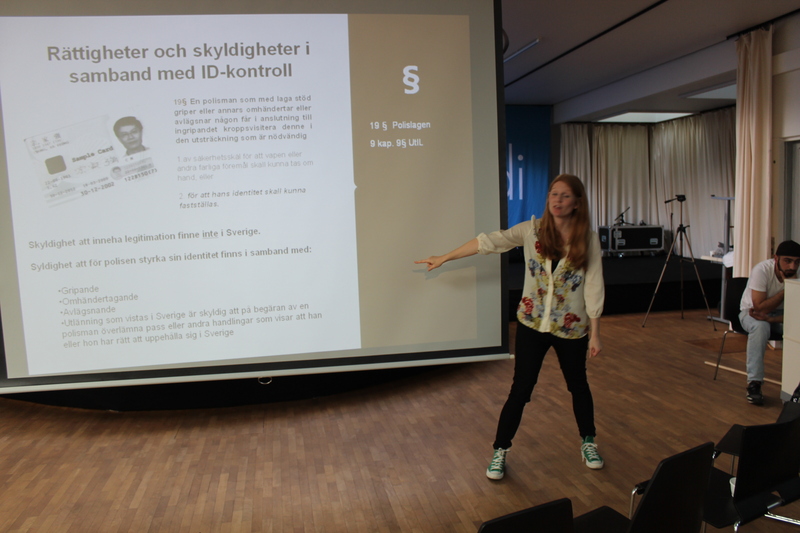 The idea was to focus on what REVA is, what the different laws say, what the structures look like, what can be done and not, listen to some stories by young people who have come to Sweden without papers and learn about the psychological effects of e.g. PTSD, Post-Traumatic Stress Syndrome. Despite the serious subject about a phenomenon that provokes many feelings and harsh life destinies, and can be seen from many different angles, the seminar was held in a very welcoming, loving and respectul spirit. Some youngsters have been educated by the Hassela Movement in leadership, ART= Agression Regression Training, different cultures etc, with the intention to help other young people who are or have been in trouble or some kind of abuse. 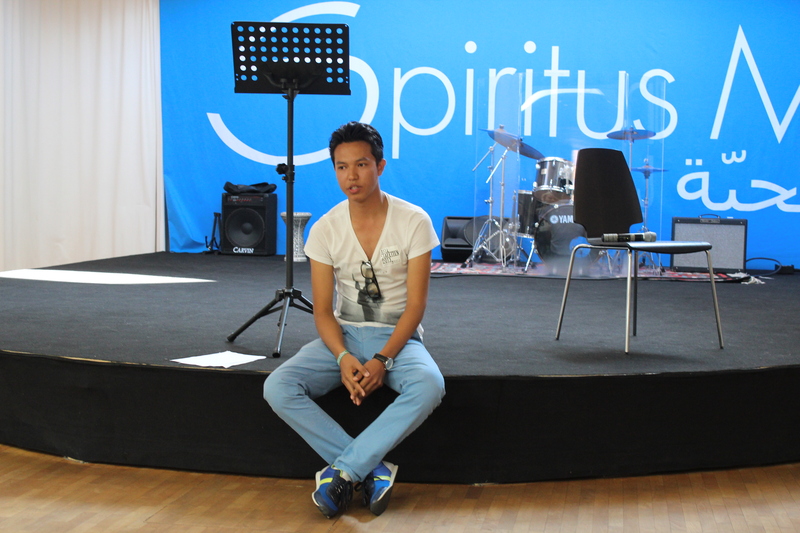 When I came to Mäster Johansgatan 6 and the premises belonging to Spiritus Mundi/Spirit of the World/Dunia al-Muhabba I was welcomed and shown into the bigger room. I talked to my former pupil Parisa Lashgari and her mother who were preparing food there. 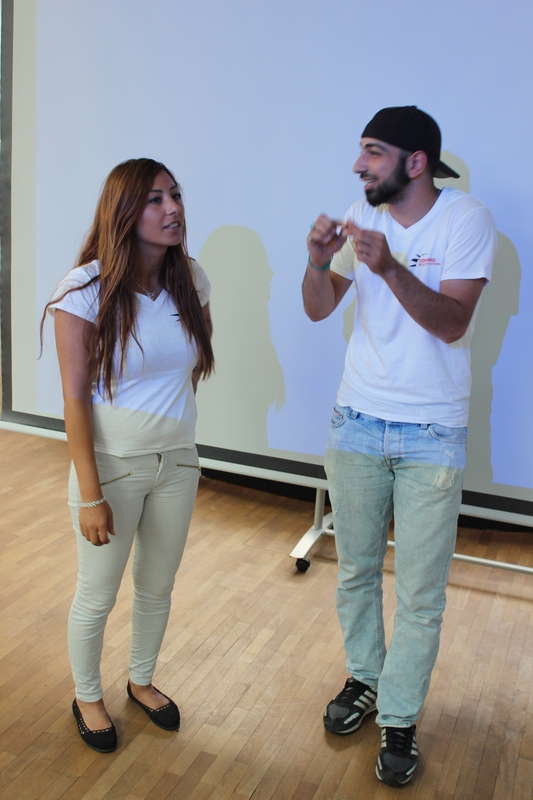 Parisa has never been in trouble, but she is a positive force and she joined Hassela a little more than a year ago. After the young adults had got the theoretical education for eight weeks by Hassela they decided to start a youth movement and they have existed for a little more than a year now. 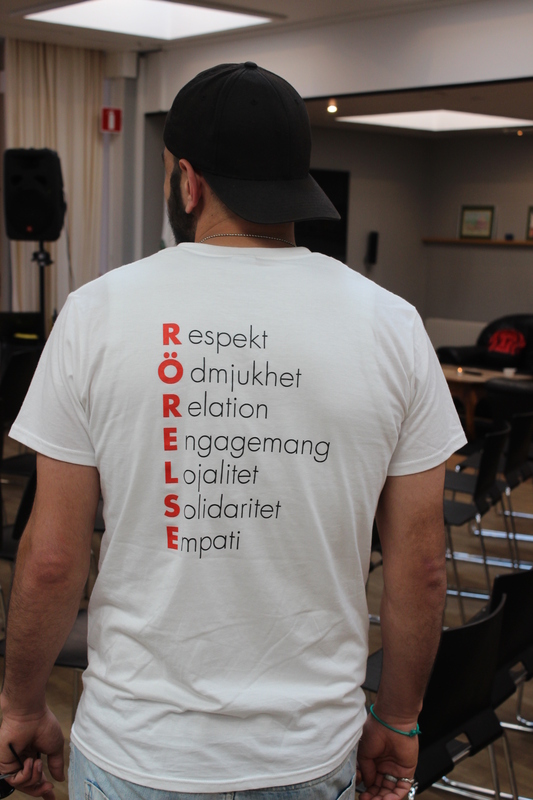 Those active wore a t-shirt with seven words written on the backside: Respekt/Respect, Ödmjukhet/Humility, Relation, Engagemang/Commitment, Lojalitet/Loyalty, Solidaritet/Solidarity, Empati/Empathy. The initial letters in each word were written in red and when one read those letters from top to bottom they shaped the word RÖRELSE/MOVEMENT. These young adults really gave these words a true meaning, because they showed us all how to enbody it to make it part of a dignified life. Before we started I also talked to another one of my former pupils, who also had me as her mentor when she was in lower secondary school, Anita Karroum. My friend Gustavo Nazar, who sadly enough couldn’t be present was glad that I would come. We were welcomed by Amar Habib and Omar Mizo who told us a little about Hassela Ungdomsrörelse: how they wanted to see a change in their own lives and the society. A positive change. Amar also explained what the subject for the day was. The first on stage to speak was a refugee from Afghanistan named Ali Ahmadi. Ali had problems with the Swedish language so he chose to speak in English. Ali Ahmadi comes originally from Afghanistan where his ethnic group, the Hazars, is harrassed and killed, even though they have lived there much longer – 7000 years – than the dominating group, he said. When Ali was seven or eight years old he couldn’t go to the doctor because he was a Hazar for instance. When he fled the country he went first to Iran, where also Hazars are harrased and killed, and he also was in England for two years. In 2011 Ali came to Sweden where he has been living a conceiled life and 18 months without papers. The second speaker was also named Ali…Ali Reza. This young man told his story mostly in a broken, but quite understandable Swedish, despite the fact that he only has been here for only five months. Ali came here at the age of 16 as a single refugee and he too is a Hazar from Afghanistan. On his way here he had seen families on the run, and he told us how they easier got help than he did as a single child. The police in the different countries didn’t stop the families, but single refugees like him. Poor people like himself get lots of trouble in Sweden, Ali explained, but he also said that it is even worse in the other countries he’s been to. “There are expectations on us, nobody wants to help us and if someone gets ill you might as well die, because nobody cares. As a refugee you have no human rights whatsoever, noone will help you, but all will use and abuse you. You have to leave everything of value behind when you run” Ali exclaimed with frustrated fervour. Many are abused as slave labour, get raped, beaten, imprisoned and badly treated on the way. 50% of the refugees without papers are almost dying, according to Ali who have seen it with his own eyes. When he was in Turkey the Turkish police took Ali’s cellphone and didn’t allow him to contact anyone. After 21 000 kilometres on the run Ali Reza came to Sweden. He’s naturally critical of the REVA project and says that on the one hand the Swedish government has now passed a law to give refugees the right to get medical care and education, but on the other hand there’s REVA, which is meant to kick as many as possible out. Despite this Ali said that Sweden nevertheless is the first country where people have wanted to help him and others like him, where people listen to what he says and that he’s treated with respect also. “Sweden is the best place in the world”, Ali added. He also explained that we are all humans, and that he wishes to educate and become a positive person in this society, even if he now sometimes is nervous, angry and worried. Finally Ali told us about the Asylum Relay Race 2013 which started from Malmoe to Lund yesterday, and will continue until they stop in Stockholm in a few days. There will be 34 stops on the way: Malmoe – Lund – Landskrona – Helsingborg – Markaryd etc. The next speaker was the lawyer Karin Henrikz from Malmö mot Diskriminering. She’s been working for them for two years and is very dedicated. She explained in a very good and pedagogic way what the laws say, and what the structures look like when it comes to REVA. The letters mean Rättssäkert och Effektivt VerkställighetsArbete/ Legally Secure and Efficient Execution Work. It’s a co-operation project between the Migration Authority, The Crime Correction Board and the Swedish police, but in accordance with instructions from the Swedish Government. Karin told us that the REVA-project was initiated in 2009, and that they chose Malmoe as a pilot project city, because it’s close to the European continent, many immigrants and refugees come here, but is smaller than Stockholm and easier to survey. However one didn’t inform the local politicians here in Malmoe about it, but kept it secret for a long time. The border police have been ordered by the government to intensify the hunt on refugees without papers and are supposed to do that until June 2014. Even if the REVA-project started here in Malmoe it has also been implemented in the other larger cities as well. However it was first in 2012 that the REVA-project was noticed and mentioned in the media, and the local authorities and politicians learned what was going on. In the Regulation letter for 2013 from the Government to the Swedish Police the police are told to “improve the efficiency in their work to execute dismissal and deportation orders”. 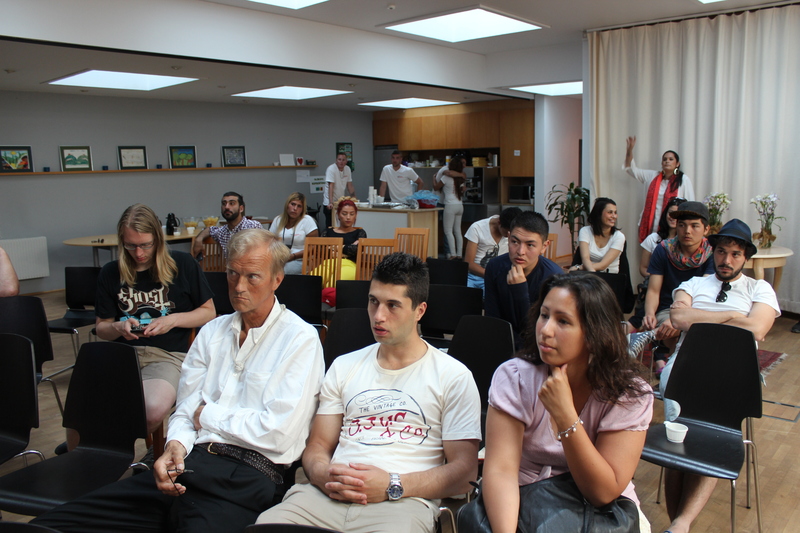 Karin Henrikz told us that the police bosses had been sent to courses in Lean-productions. Originally Lean-production was invented to improve the efficiency in the industrial construction of cars. Make it quicker, more efficient and structured. Many companies have adopted the idea of Lean-production. In recent years the idea of Lean-production has been implemented also in schools, within the police, within the health-care system such as hospitals and wards, within the psychiatry. This has led to many quick “economic” decicions which have affected many people with lives, feelings, destinies, families. According to Karin Henrikz she could well see the use for Lean-productions in productions of cars, but not as well when it comes to human lives. She also told us that there exists a “solidarity and handling of migration waves” between countries within the European Union. This litterally means that there is an authority and government consensus about keeping immigrants from outside the EU out, and to shut the borders, building walls. She here also mentioned the difference between Citizen Rights and Human Rights, which not always are the same thing. The citizens in a country or an inter-national union always have more Citizen Rights than those without, and it looks the same all over the world, but in different constellations, whether we like it or not. The police follow various laws in their profession, and carry out their orders. When it comes to REVA and “inner foreigner controll” the police work is regulated in Chapter 9, §9 in Utlänningslagen/The Foreigner Act, 2) the regulations from the National Police Board, and 3) the inner foreigner controll for the police, RP SFS 2011:4. Karin also told us that a single police officer has to follow orders, otherwise he or she won’t be doing his or her job, and it’s very difficult for a police officer to oppose the rules given. She also explained that the judicial system in Sweden is excluded from the Discrimination Act/Diskrimineringslagen 2008: 567. Here Karin also stated that there also sometimes is a discrepancy between judicial justice and moral justice. In the REVA-project so called “racial profiling” is used, which means that people with a certain ethnic background is stopped. However, according to the European Union’s Bureau for Basic Rights this is forbidden. “To stop and body-search someone when the only or main reason is to controll that person’s race, ethnic belonging or religion is a direct case of discrimination and is illegal”. Karin also told us about how long the police might take care of people and keep them in custody, where to go if you feel ill-treated and also about the case of Stephen Lawrence in the United Kingdom. Stephen Lawrence was a young man who was murdered in the beginning of the 1990’s. The British police assumed that the killing was gang related and didn’t bother to investigate it really and also lost important pieces of evidence. After 18 years it became clear that there was a racist motive behind the murder and also a racist connotation in the police mentality when they handled the case. Since some time back the British police are ordered by UK law to report every year how they oppose racist influences and mentality in the British police force. Karin ended by telling us to use media, peaceful demonstrations, mass reports of abuse, being harder when confronting and influencing politicians, arrange seminars and specific topic days like this one. Between the speeches we had breaks for just talking with each other, discuss the topics and so on. Amar Habib was in a splendid mood and before one of the pauses he wanted us all to play a little and sing the nursery rhyme “Ipsy whipsy spider” in three versions: one tiny, one medium and one big. He called upon his colleague from Hassela Amani Abdel-All to help him lead us in the game. During one of the breaks I also asked my former pupil Parisa how they in Hassela Youth Movement are treated by outsiders. She told me that they sometimes initially are treated with suspicion and prejudice, but after a while people get to see what they actually are doing and easen up. 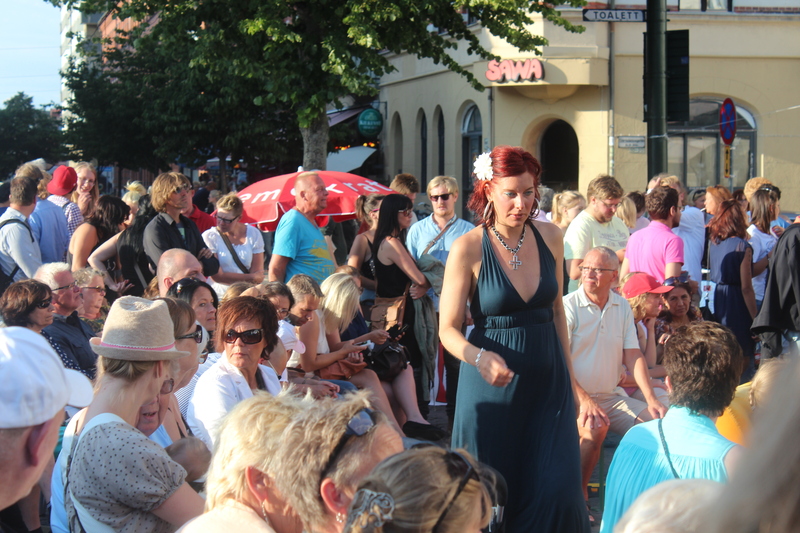 That’s also how it was during the Elm Valley Week/Almedalsveckan on the island of Gotland recently. They were there. Anita also talked a little with me and it’s these two young ladies you see in one of the pictures above: Parisa to the left and Anita to the right. Kenjiro Sato who’s a psychologist originally from Chile, now working at the “Team for War and Torture Injured” at Malmo University Hospital told us about the psychologic effects of a trauma like being a refugee without papers. He talked about “the spaghetti-theory”, also called “the migration- or refugee-theory”. It’s describing that there’s a mishmash of spaghetti in the soul, everything is in chaos. It begins with a “sometimes” ordinary life in the home country, family, group belonging, every day life. Then comes a time of oppression which creates great trauma: wars, persecutions, killings, disaster in some form. People you love die, family members, relatives, your teacher is killed, your uncle, your city is burned or occupied, your country, or your group is persecuted. As a last resort you flee your country. Not as the first thing…The last thing. You have to run and leave the old life and security behind. During the flight many experience many traumas, robbery, violations, rapes, betrayals, intimidations and loss of human dignity and value…EVERYTHING. You lose trust in people. These traumas lead to PTSD= Post Traumatic Stress Syndrome. In a new country you apply for asylum, and the agony continues by waiting for an answer. The PTSD includes variations of different feelings and symptoms: fear, helplessness, fright, agony, relived PTSD, painful memories, flashbacks, nightmares etc. You might lose interest in meeting people, lose interest in important things, get a feeling that you have a short future, get apathetic and lose strength. You might get irritated easily, are easily frightened, lose your temper often, suffer from insomnia and get paranoid. To solve this it might help you to breath in order to relax, take walks if you can, ride a bike, train your physique if possible. The children’s doctor Lars Gustavsson and his wife have developed a method. They were working in the Middle East and when they came back to Sweden and Lycksele they developed the method STROF = Struktur, Tala, Rutiner, Organisation, Föräldrastöd. In English this method is called STOP= Structure, Time, Organized Play and Parental Support. If there are no parents some other good adult. He also said that it was difficult helping the traumatised youngsters because of REVA, since they are surveyed. It was very interesting listening to Kenjiro Sato and his wise words. Ali Ahmadi, Omid Mahmoud and Ali Reza said at the end that they don’t want to be afraid of the police and don’t want to flee once more. Now they walk for freedom. They and others. It was a good seminar and I learned a lot. These people who try to do good are the true heroes and heroines of society. Our present day and part of our future. Yesterday evening the Pashtun girl Malala Yousefzai from Pakistan held an important speech in the UN. It was on her 16th birthday. She was born on July 12th 1997 in the city of Mangora in the Swat district in Pakistan as daughter of Ziauddin Yousefzai, who’s a poet, educational activist and school owner of the Khushal Public Schools in the country. Malala very early on showed huge talents and was encouraged by her father to go public. Already at the age of 11 Malala Yousefzai held her first public speeches. She’s fervently fighting for the rights of girls to get education in a country surveyed and harrassed by the Taleban and Al-Qaeda. In the summer of 2012 the Taleban decided to assassinate Malala and her father. On October 9th 2012 Malala was attacked by Taleban on a bus on her way to school. The man shot her in her temple and some of her female friends. Malala though survived. I wrote more about this in my text “Malala – A young heroine from my perspective” on January 4th 2013. You might read it there. Malala was then treated on hospital in Pakistan and England. She survived and has recieved huge support both in Pakistan and internationally. Yesterday she held a speech in the United Nations, New York. Many people listened and her speech was a very moving and important speech and deserves to be recognized as one of the most important of our times. This is how it started: “In the name of God, The Most Beneficient, The Most Merciful. Honourable UN Secretary General Mr Ban Ki-Moon, respected president of the General Assembly Vuk Jeremic, honourable UN envoy for the global education Mr Gordon Brown, respected elders and my dear brothers and sisters: Assalamu alaikum”. Malala spoke calmly and clear while she brought up many important aspects of the world we live in, and her speech will no doubt go down in history. As a symbol she had dressed herself in a shawl that had belonged to the late Benazir Bhutto who was the first woman to rule a Muslim country, Malala’s country Pakistan. Malala then said: “First of all thank you to God for whom we are all equal and thank you to every person who has prayed for my fast recovery and new life”. She explained how grateful she was for the support from all over the world, how important it was to get education, and that there is an equal chance for both sexes. This teen-age girl said many wise things that deserve to be pondered upon and acted according to: “If we want to achieve goals, let us empower ourselves with weapon of knowledge, let us shield ourselves with peace and unity”… “Dear brothers and sisters, do remember one thing: Malala Day is not my day. Today is the day of every woman, every boy and every girl who have raised their voice for their rights”… “Thousands of people have been killed by terrorists and millions have been injured”…. “Extremists are afraid of women, education. They are afraid of change”. She also explained that even though the Taleban hated her and had tried to kill her she didn’t hate them back, and if she had a gun she wouldn’t shoot them. After the assassination attempt on her she had learned the meaning of forgiveness and compassion. She had learned it from Mohammed, the prophet of mercy, Jesus Christ and Lord Buddha. “This is the legacy of change I have inherited from Martin Luther King, Nelson Mandela and Mohammed Ali Jinna”, she continued. “One child, one teacher, one book and one pen can change the world”. “Dear brothers and sisters, we want schools and education for every child’s bright future. We will continue our journey to our destination of peace and education for everyone”… “We must believe in the power and the strength of our words. Our words can change the world”. “Peace is a necessity for education… We are all tired of these wars. Women and children are suffering in many ways in many parts of the world”. Here she explained how difficult it is in the countries which are poor, or just in war, and how patriarch structures destroy things. Unesco and Save the Children have made a report recently which shows that 95% of the children who don’t go to primary school live in low and middle income countries: 44% in sub-Saharan Africa, 19% in south and west Asia plus 14% in the Arab states. In 2012 more than 3,600 documented attacks on education, including violence, torture and intimidation against children and teachers leading to serious injuries or death were made. We have to consider this to make things better. There are no doubt problems with misogyn attitudes in countries such as Pakistan, in other Muslim countries, but also in the West. I will come to that in a moment. There are however different levels of how that misogyn hatred is manifested and “accepted” in society. On March 26th this year a fatwa which called Muslim young women to a sexual jihad in Syria was stopped in Tunisia. The fatwa had appeared on the Internet, and called young women to support the rebell soldiers in the Syrian civil war, the mujaheddin, with sexual favours. Among others had 13 Tunisian teen-age girls and young women gone to Syria and headed to the battle-fields in response to the sexual jihad fatwa, written by one Sheikh M.A. Tunisian Minister of Religious Affairs Noureddine al-Khadimi rejected the fatwa and told the Tunisians that they didn’t have to listen to that fatwa. Yesterday, Friday July 12th 2013 former dentist assistant Melissa Nelson, 33, lost a second hearing in front of the Iowa Supreme Court, USA. She had been fired after ten years work as dentist assistant by her until now boss James Knight, because he found her “irresistable” and was afraid that he migh be tempted to have an affair with her. He wanted to save his marriage, and made this as a precaution. Melissa Nelson though had not been flirtatious, but lost her job all the same. The Iowa Supreme Court agreed that she hadn’t done anything wrong, but they still said that James Knight couldn’t be blamed for wanting to save his marriage. So…Melissa Nelson lost her job and her income. Here in Sweden another gender-based bomb has exploded this week. Earlier this year I wrote on this web log about the hatred against women on the Internet here in Sweden. This week it came again. Male sport journalists have mocked, hated and ridiculed female football-players on Twitter. Here are a few of their tweets in English translation: “Why expose oneself for watching 22 lesbians who play football-players…What the.” “The ladies national team… Lesbian whores that’s what you are”. “Look. Sweden’s whores how can they kick such penalties hahaha what bloody losers, ey”. These are the words of grown-up Swedish sport journalists this week in July 2013. Anja Gatu, chief editor for the sport pages on the newspaper Sydsvenskan have this week commented these tweets and this phenomenon. She explained in a filmed interview on Dygnet Runt/24 Hours by Bengt Arvidsson yesterday that this hatred is very common, and that it becomes even more distinct in bigger competitions and she too get her share of male hate for her line of work and her person. Maria Hagberg, social worker and expert on honour-related issues wrote on Facebook yesterday: “In Spain they don’t even show EM in ladies football on TV despite the fact that Spain is participating and despite Aldomovar”. This negligence and hatred is not of the same level as the physical lethal attack on female students in Quetta, Pakistan recently, but the mechanism is the same and just as despicable. What happened in Quetta? The young women were attacked on their way to university by a group of Taleban who blew bombs, threw granades, injured and killed several people. When the survivors came to hospital new Taleban waited there and continued the attack, slaying surviving women, nurses and doctors. All these aspects are important to consider. How do we end the gender hate? I sometimes criticize women too, and I might be clear in my criticizm since I also see women participating in destructive and evil structures in our societies, making bad choices and evil deeds, but I try to be fair and also criticize both myself and other men as well. Why? Because we must find ways to build bridges between men and women in a positive and loving way instead. That’s why constructive criticism in a fair way is needed, so that we might work together and love each other, instead of continuing on a way of rivalry, spite, intrigues and feeding a road of male hate of women and female hate of men. Here education and awareness is of the essence, and peaceful solutions in our troubled, fragile and sometimes dangerous world. That’s why we all are important and need each other in a good way. That is also why Malala’s speech and her message is vital for our way forward, for the survival of our world and our species.